CUSP NYC worked with TV data analytics company, 605, in collaboration with Thiel Architecture + Design, and branding agency Collins, to select and curate artwork for its new NYC office. Curation of the 605 space offered a chance to inject outside creative energy. We were not simply looking to fill the space with art for art’s sake, but looking for the art to do much more — to provoke, instigate, surprise — in an exciting “visual dance” that reflects critical components of the 605 brand. As 605 occupies the realm of data, trends and forecasting, CUSP worked from the 605 mission and process to display visual representation of the company’s core offerings in an exciting and contemporary way. Initial selection built off a more literal interpretation of analytics; images that reference data, in that their visual structure shares some of the same form language we recognize in matrices, graphs, and grids. This imagery served as a jumping off point into the world where data originates. Here we explored quite simply, people and their habits. With market research, in the beginning, and in the end there is the viewer — the face and human behind the number, the house that holds the TV, the family that watches it. The 605 collection reflects the human experience in bold, colorful ways. Through thoughtful placement of individual works we built relationships between the pieces, and activated the space by creating opportunities for discovery. Those relationships are stories to be written, and re-written by the viewers. Combining visual representations of data with artwork that references those that generate and consume the data, we can make new connections between the human experience and the endless information that makes up who we are and what we do. The range of styles and media in the 605 collection; including neon, photography, vintage posters and fine art from global artists, offer chances to pause and break routine. These were the opportunities we sought to create — to disrupt the predictability, to encourage the “what if, how, and why...” all while staying deeply rooted in 605’s commitment to data evaluation. In April 2015, CUSP NYC was chosen from 12 entrants for the coveted Norwood Arts Club Annual Curation Program. The selection and installation process culminated in an opening event where the newly transformed first floor was on display to the club's members. The year-long partnership was then brought to a close with the sale of the selected works in August 2016. Our installation, titled Singular Stories, sought to evoke curiosity and promote dialogue. Encompassing painting, sculpture, light and woodcut installations, large-scale works blended into a cohesive statement to powerfully invigorate the space. A sometimes subtle back-and-forth correspondence between the artwork set up key visual and intellectual relationships, all of which stemmed from stories of Norwood's past including Andrew Norwood himself, the landmark building at 241 W. 14th St., and the club's members. The selected works, totaling 25 pieces by 12 artists, were chosen from the gallery’s collection in partnership with Cheryl Hazan Contemporary Art, with the criteria of true singularity. Each of the selected artists had developed a unique visual language through distinct techniques that often incorporated unconventional materials and processes. This combination of unique pieces provided the basis for our theme —disparate stories fit. The club's members were invited to contribute their own ideas, thoughts and passions to each artist’s approach or view in an effort to discover each piece's connection to the club's history. We believed the resulting discussions would strike at the very core of the social arts club at Norwood. CUSP NYC worked alongside private collectors to curate their new residential loft space in the West Village. This collaboration included the selection and sales of 20 new pieces, including work from contemporary artists SinXero and Joe Iurato, as well as secondary market pieces by Keith Haring and Sam Glankoff. 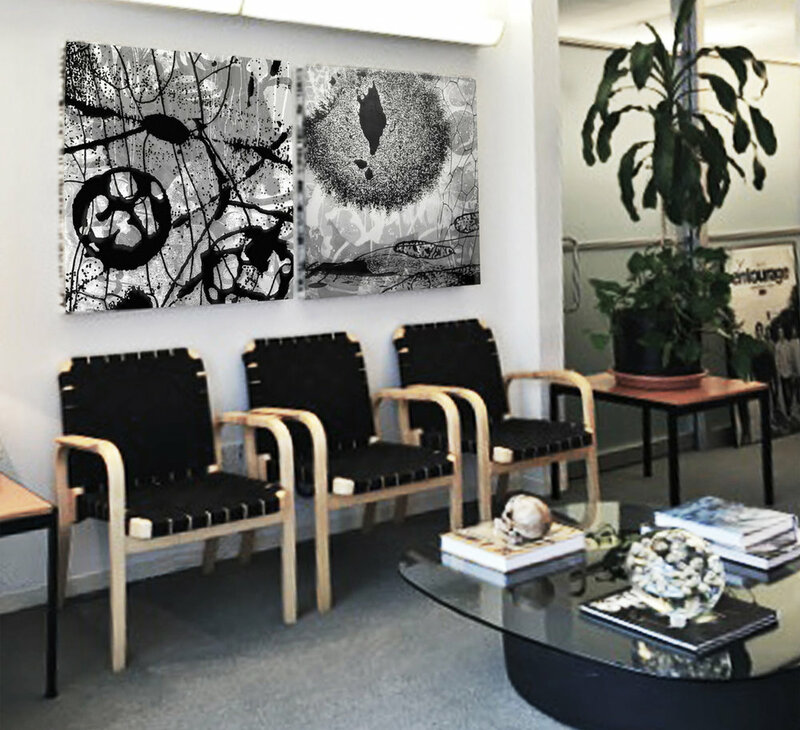 Curation of the space involved the coordination of newly purchased pieces with artwork from the client’s existing collection. The framework for this curation project was constructed around the history of the space. As an old book depository, the converted loft is open, slightly industrial, and features wooden beams and wall treatments. At the center of the loft, the dining room proudly features two original Haring subway drawings, alongside a series of small woodcut prints by 20th century artist, Sam Glankoff. Several large scale abstract expressionist paintings frame the adjacent living spaces. These bursts of color are anchored by the largest piece in the loft, a black and white diptych made as a collaboration between street artists; Scott Walker, Jon Burgerman, and L'Amour Supreme. Moving down a hallway, away from the living areas, there is a grid of bold, iconic prints from Shepard Fairey. The collection is capped off by a wall-sized abstract painting by SinXero in the master bedroom, where rich and commanding blues blend into each other and offer a balance to the more graphic, high-contrast aesthetics of the other pieces on display.